I’m always suspicious of Americanized Asian food. For the most part they are deep fried, over seasoned approximations of Asian food at best, and tasteless mush of unrecognizable ingredients at worst. Of course Americanized Asian food has its benefits: Orange Chicken from Panda Express is my husband’s go-to hangover food. 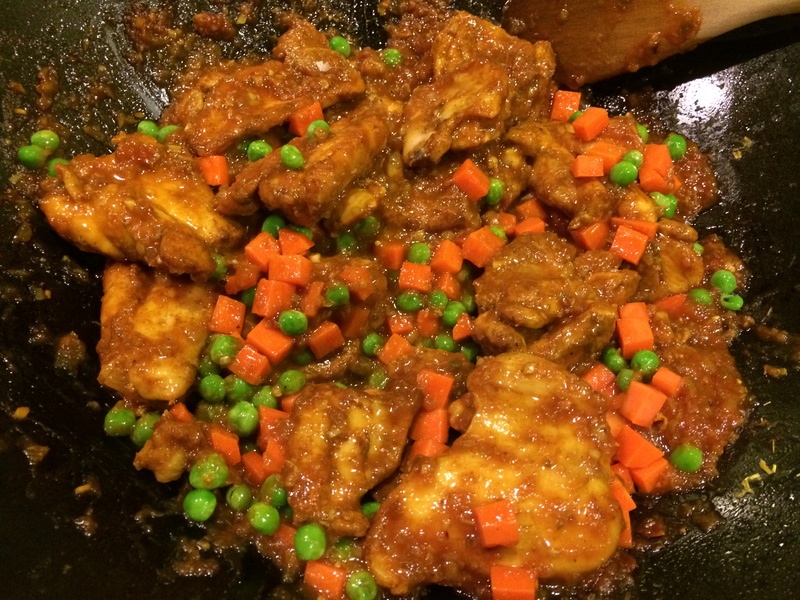 I found this Thai chicken recipe from Andrew Zimmern, known for Travel Channel’s Bizarre Foods shows and immediately wondered if this was an Americanized knockoff recipe. First of all the name of the dish is suspicious: “Sweet and Sour Bangkok Style Chicken”. Sounds like a dish from your local hole in the wall Chinese/Thai delivery place. Looking at the grocery list, it includes Ketchup as one of the main ingredient for the sauce, another red flag. 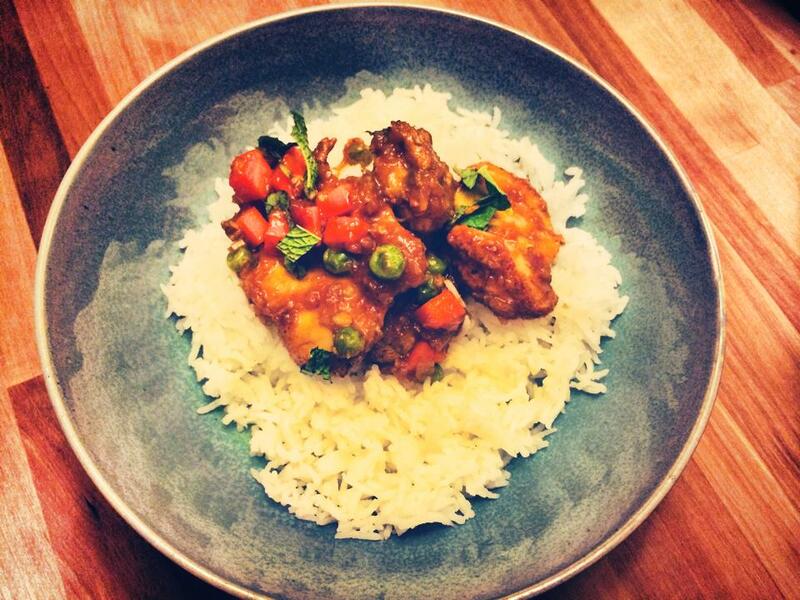 I did some research online and found a photo of a dish titled “Bangkok Chicken” which looked most like the Zimmern recipe from the Thai restaurant Bangkok Crossing in Detroit Michigan. Through further research on Yelp on Bangkok Crossing, I found that it was indeed a dish that ‘tasted like sweet and sour Chicken”. Now Zimmern claims that he had this dish in Thailand, and got the recipe directly from the street vendor. Perhaps he fell off the wagon and ended up at Bangkok Crossing in Detroit during a particularly good bender. Either way I was intrigued to test this dish out… worst case I learn a hangover recipe for times when Mark and I are too tired to get take out from Panda Express. Upon closer inspection of the recipe, it’s actually quite healthy and simple. The chicken is fried, but only lightly, and instead of a batter, it is dusted with turmeric and cinnamon powder. The sauce is composed of a spice paste made with lemongrass, shallots, garlic, and chilies, along with the aforementioned ketchup. 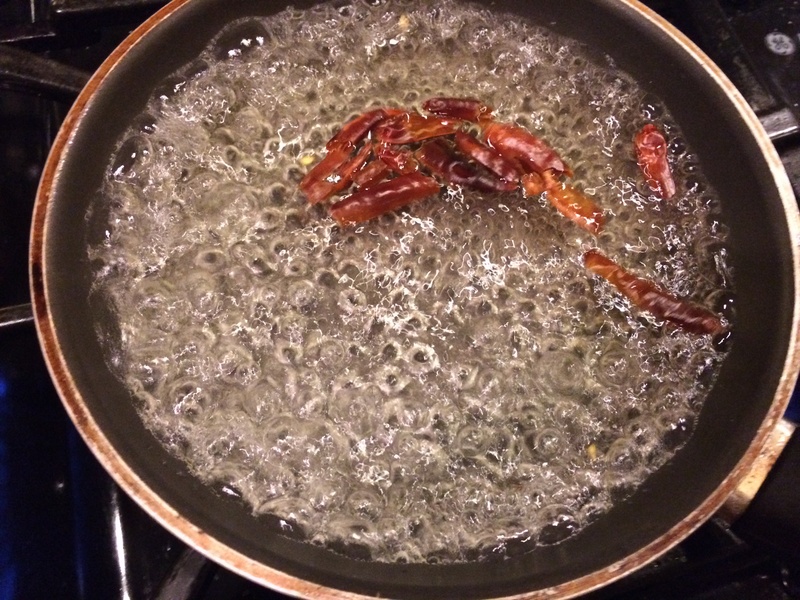 To make the spice paste, dried Arbol chilies are boiled and soaked in hot water until soft, about 10 minutes. Arbol chili is the Spanish version of Thai Bird Chile, you can find the dried version in Asian or Indian grocery store, or sometimes even the International food aisle at regular supermarkets. 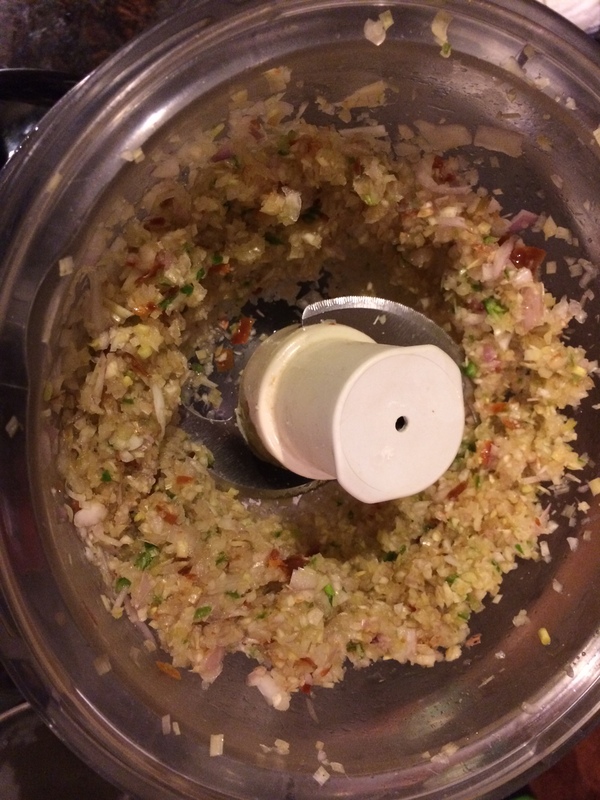 Drain the chilies and transfer to a blender or a food processor along with the shallots, garlic, lemongrass and fresh Thai Bird Chilies, and process until a thick paste forms. 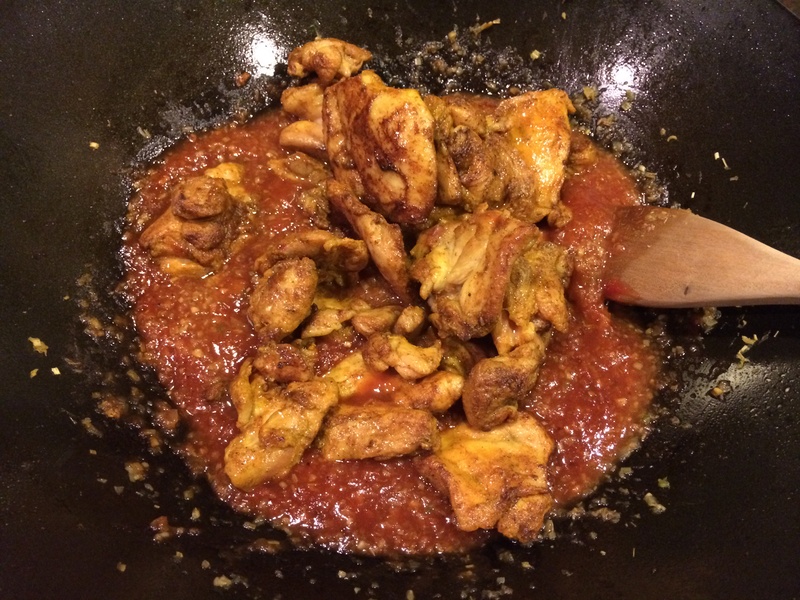 Set aside the spice paste, while the chicken is fried. 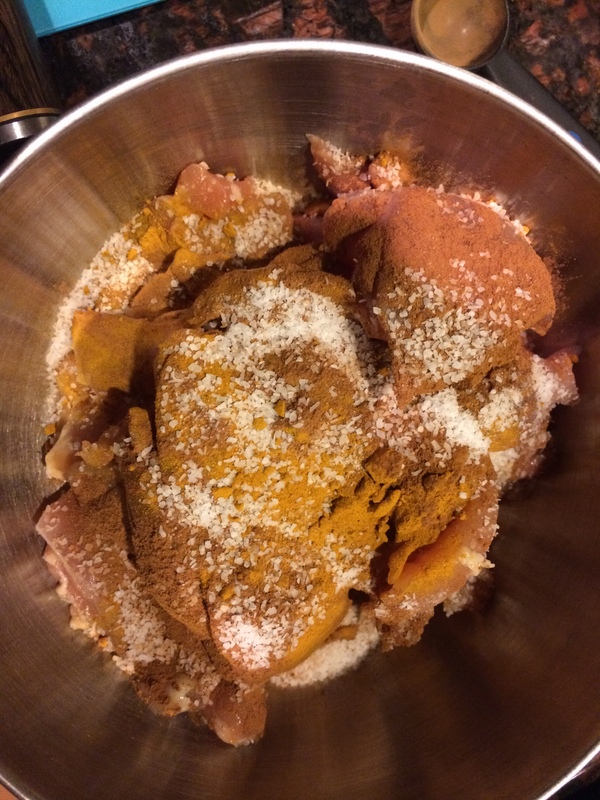 Toss the chicken thighs in turmeric, cinnamon, and salt. Fry the chicken in 3 tablespoon of peanut oil until browned on both sides in a wok or heavy bottomed pan over medium heat. 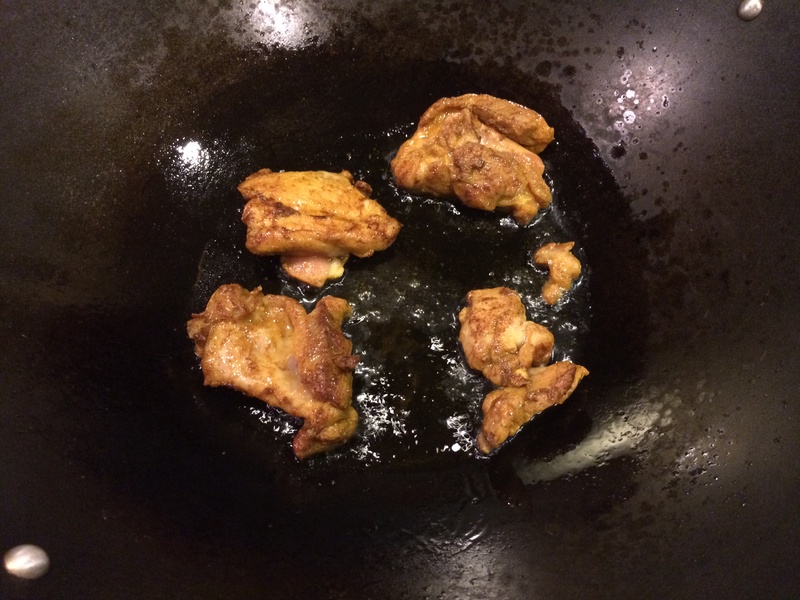 You want to fry the chicken in batches to not over crowd the pan, and also to control the amount of moisture released from the chicken during cooking. If you have too much chicken in the pan, you’ll end up steaming the chicken, which will be over cooked by the time it’s browned. You may substitute other oil for peanut, but it does have a higher smoking point than most oils, which makes it preferable for frying. Olive oil may contribute a taste that would not be complementary to the rest of the flavors in the dish. Remove the chicken from the pan and set aside in a plate. In the same pan used to cook the chicken, add the spice paste and stir fry until fragrant and slightly browned over medium heat. 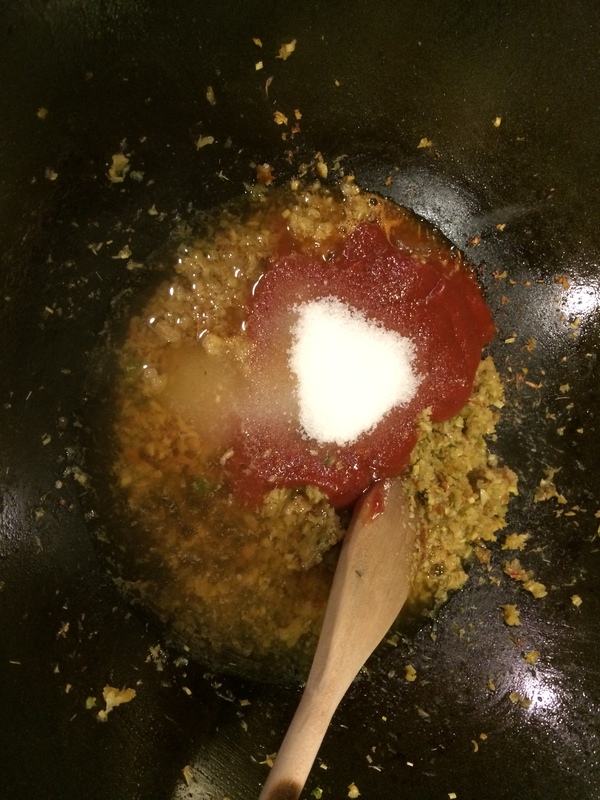 Add the ketchup, vinegar, sugar, and 1/2 cup of water to the chili paste and stir to combine. Bring the mixture to a light simmer. Return the chicken to the pan and simmer over low heat until cooked through, about 15 minutes. The sauce should be thick and should coat the chicken easily. While the chicken is simmering, bring a small pot of water to boil, blanch the chopped carrots for 3 minutes. Drain and add to the pan after the chicken is cooked through along with the frozen peas. Simmer until the peas and carrots are heated through. 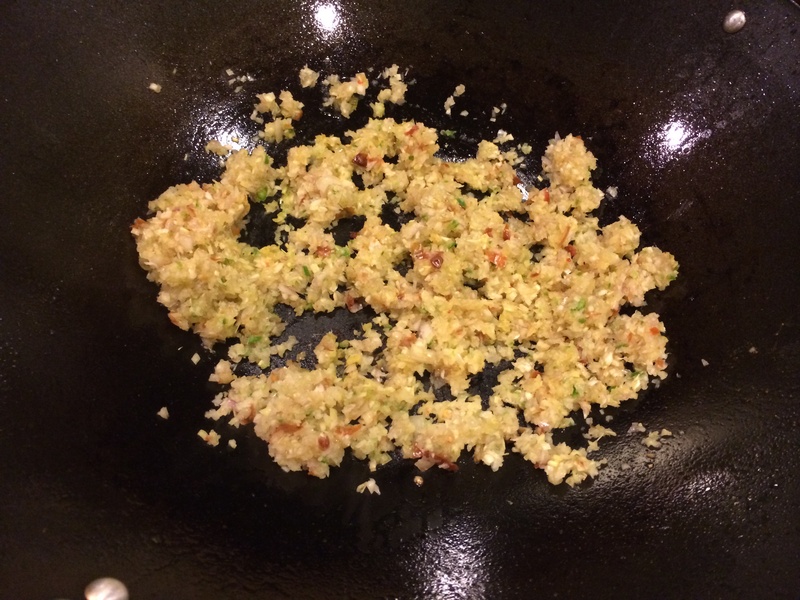 Transfer the mixture to a dish, garnish with chopped mint, and serve over steamed rice. I have to tip my hat to Andrew Zimmern as this was a great dish. The chicken was tender with a slightly crunchy texture, and the sauce was the perfect combination of sweet and sour. 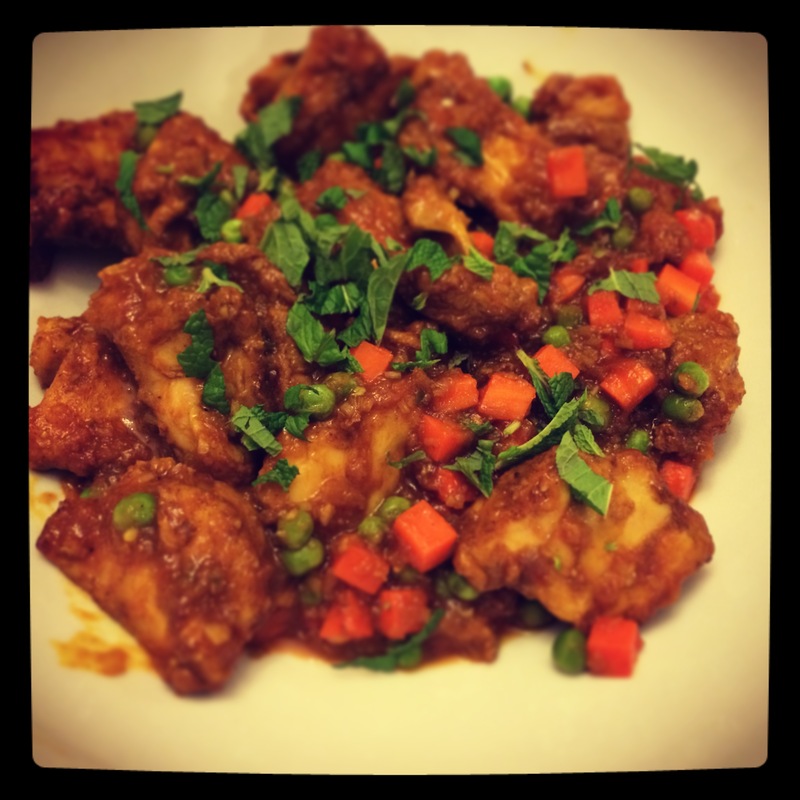 It’s a easily adaptable dish with all types of protein, and definitely not just for hangovers.